NAIROBI (Reuters) - Eritrea has rejected a U.N. Security Council demand that it withdraw military forces from its border with Djibouti within five weeks.. Comment:Now we wait five more weeks to see what the UN will do with the help of the French and the new US Ambassador to the UN! Don't be afraid to give your best to what seemingly are small jobs. Every time you conquer one it makes you that much stronger. If you do the little jobs well, the big ones will tend to take care of themselves. by Dale Carnegie. Tamrate Layne was not kidding with his new found faith after all!! A flawed Strategy Paper for the US President-elect. Government encouragement for Diaspora investment. UN in Eritrea pull-out ultimatum The UN Security Council has given Eritrea a five-week ultimatum to withdraw its forces from a disputed border region with Djibouti. UNITED NATIONS (AP) — The United States circulated a draft resolution calling for a U.N. peacekeeping force to be deployed in Somalia to replace a small African Union force, but leaving the Security Council to make a final decision by June 1. Comment:- Birtukan decision to use legal means to win her freedom is the right step to take for a legal opposition leader. Win or loose Birtukan using the court and legal venue will go a long way to help the democratization process and in the process her sincerity to respect the law of the land. 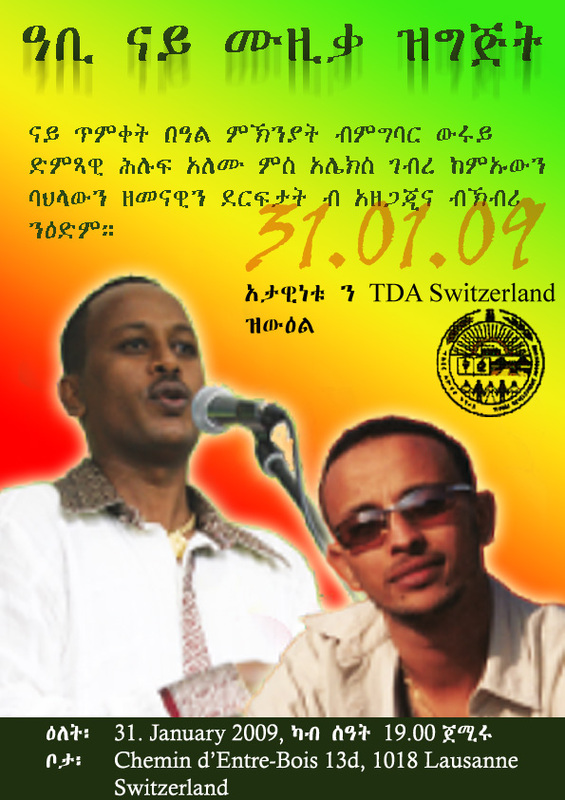 The Tigrai Development Association (TDA) has successfully concluded its General Assembly, which was held in Mekelle, Tigrai at the Martyrs Hall On Jan 3rd and 4th 2009. This year’s keynote speaker, H.E. Ato Tsegay Berhe the President of Tigrai Regional State, in his opening speech applaud the achievements made by TDA in the areas of education, training and health. Commentary on President Isayas Afeworki latest Interview with his own TV station. (MoFA) Jan 09 2009:- President Isaias Afewerki of Eritrea gave a lengthy interview to the government media on the occasion of the European New Year. True to form, his interview was short on substance and long on sloganeering. A number of questions were raised and numerous topics covered during the interview. The Desperate Misinformation Campaign of the Vocal Diaspora Surrounding the Re-arrest of Wt. Bertukan Mideka. Commentaries on Current and Other Issues (Year End Review). Raising capital from Diasporas to up lift the Ethiopian economy is a good strategy on reversing immigration too. Hard Currency: Bonds and Opposition Economics! UTNA Seattle invites you to Lekatit 11 Celebration!! UTNA Chicago invites you to Yekatit 11 Celebration! !